The Fundy Footpath is a rugged, wilderness hiking trail that hugs the Bay of Fundy shoreline in the province of New Brunswick. It’s a tough trail with lots of ups and downs and switchbacks. 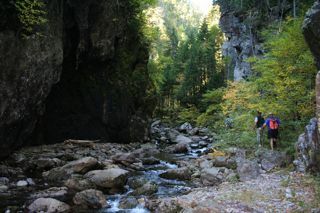 Usually this 50 km trail is a three day hike. Our feature interview today is with two guys who along with a few others, ran this trail in 13 hours. Their names are Lloyd English and Darrell Travis and they’re no slouches. Both run marathons, in fact Darrell has run Boston 12 times. And they both agree, running the footpath is the toughest thing they’ve ever done. The start of the ski season is just around the corner if it hasn’t already began where you are. We have a comment about skiing in North Carolina in October. (Who knew you could ski that early in the southeast.) Gary goes to the annual ski swap at his local ski hill Poley Mountain. Ski swaps are the best places to find bargains on ski gear. And a listener wants to know more about outdoor gym equipment in public places. Podsafe music from The Crash Moderns. Email your comments to doingstuffoutdoors@yahoo.ca.